The Oh Really » Tears of a Clown. Why I Love the Internet. | Home | Halloween Night Report. 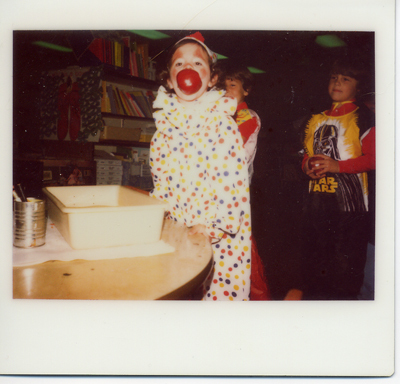 Last Halloween I posted a list of all the costumes I’d worn over the years, and today I want to tell you that I was not kidding about being a clown for ten years. 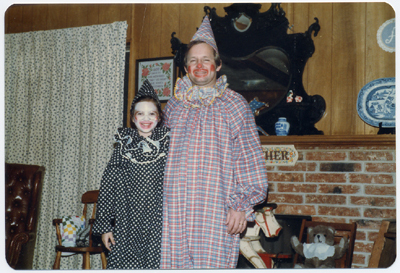 My mother, she bought one clown costume pattern and she used it well. I wore that fake smile through the majority of my childhood. This entry was posted on Tuesday, October 31st, 2006 at 11:10 am and is filed under sally. You can follow any responses to this entry through the RSS 2.0 feed. Both comments and pings are currently closed. I feel like I don’t know you anymore. And . . . how hard was it to get a apple when your bobbin’ bucket was only one apple deep? Texas must be totally full of sissy, can’t-bob types. In defense of Spencer Sager: not only does your name rule, but your Star Wars costume would likely net you a cool fifty bones on eBay. I am so afraid of clowns that I would be scarred for life if I had to be one ever, let alone for ten consecutive years. You make a cute, non-scary one, though (your stepfather is another story, although I feel sure he is a nice person). I don’t think they wanted to DROWN THE APPLELESS KINDERGARTENERS, gorjus, so they used that handy totetray. Totetrays! I want a totetray. Also: yes. My stepfather wore that to work. For several years. We pretty much do whatever my mother tells us to. I’m more scared of that large black thing on the mantle. There’s something about a plaid clown that’s just…wrong. Yeah, actually… what’s the point of waiting in line, putting an apple in a bin, and then bobbing for it? Jeez. Our children need CHALLENGE in their lives. You, Sally, deserved a more challenging task. So I just now made the connection between clown suits and bubble suits, the albatross of my generation (well, the albatross of my generation when we were in the 4th and 5th grades). You look really happy and cute in the bobbing picture, even though the bobbing was done in a totetray. I didn’t know that those were called totetrays. Holy God. Try a search for tote tray (with a space), diplomat. It will blow your mind. Uh, but did the apple even float in that tray? It looks like it might have just sat on the bottom poking out of the water, so it wasn’t really “bobbing” but more like “picking up an apple that is sitting in an inch of water with your mouth.” I really hope that no one had trouble achieving that goal. You guys are harsh! Jeez! Have you picked up an apple just with your teeth lately? I tried to bite into a caramel apple on Monday but the stick broke and I ended up punching myself in the face. It’s hard! I . . . yes. That’s the Sally I know. I can see that happening, while Larry is eating spaghetti with a pair of tongs in the background.